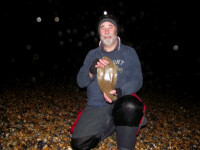 I hit Seaford beach last night only to find that it was cram packed, Not sure if there was a competition on or not but I’ve not seen that many people out for a long time. After much self debating, I finally decided to fish some spare space up at Splash point and found a spot just West of the point itself and where I had no-one to my left which gave some leeway for me to move if I wanted. I was not that hopeful of a good result considering that the sea was flat calm, I had missed low water and the early flood tide, plus it was a tad noisy with the firework display up behind me somewhere on the greens. There was no hint of a breeze and the sky was overcast but with large clear patches. 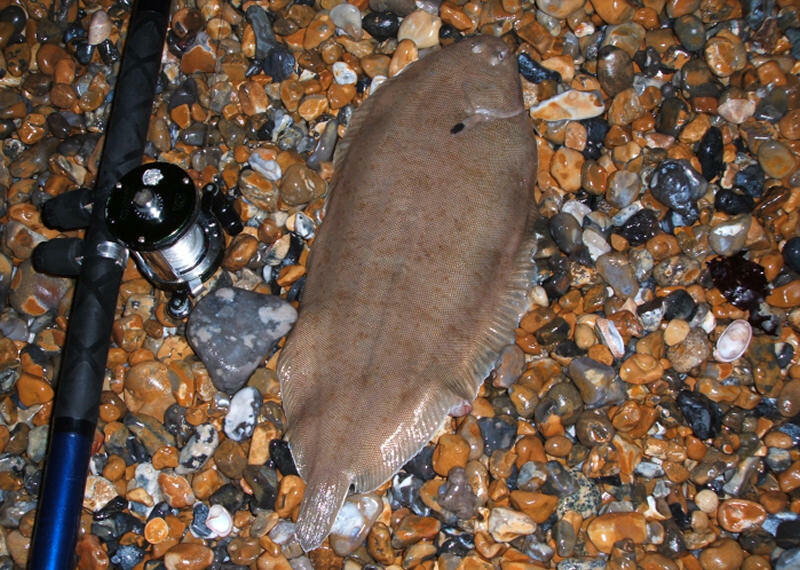 One rod was set up with a size 2 two hook flapper baited with lugworm and the other was rigged with a 4/0 pennel on a long link running ledger baited with whole squid. With both rods out, I relaxed with a coffee and watched some of the fireworks – which I have to say were pretty crap. Now, if people are going to bugger up my fishing, I wish they would at least make the effort to entertain me. Fishing was very slow, with nothing for the first hour or so, not even any whiting jumping on the hooks every five seconds. I have to say though, it made a nice change just be able to relax and enjoy the time, rather than casting and reeling in ‘pins’ on a frantic never ending basis. 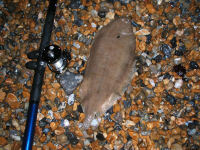 The first knock of the night resulted in the first bloody rockling of the season; I prayed that it wasn’t going to a rockling only event. 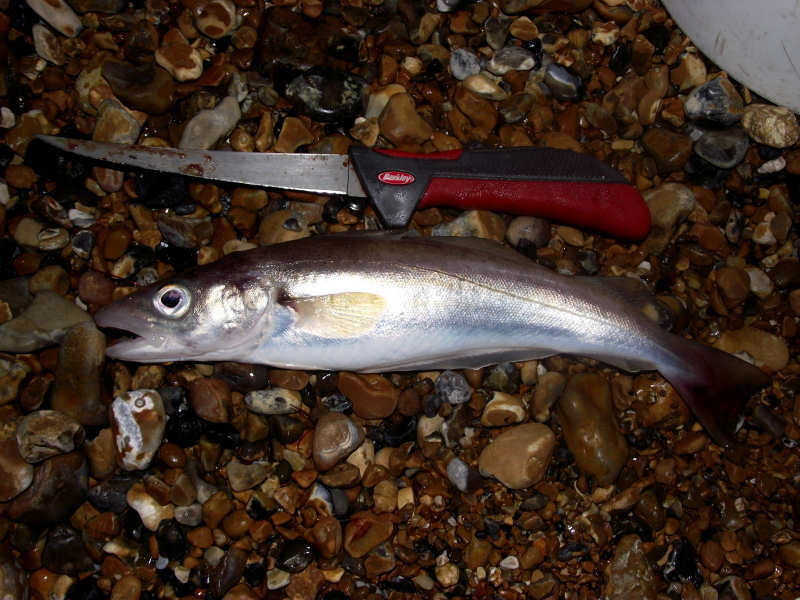 I wonder if it was as whiting free on the rest of the beach as it was where I was. It all went dead until about 9.15, when there was small pull down bite on the worm rod and then nothing – pah!. I left it while I finished my coffee and then saw the rod tip go mental in a series of plucks and pulls. I lifted into what seemed like dead weight and felt like weed with a bit of flapping. It wasn’t until I got it into the shallows that things livened up a bit, with the fish going ballistic that I thought this might a decent fish. 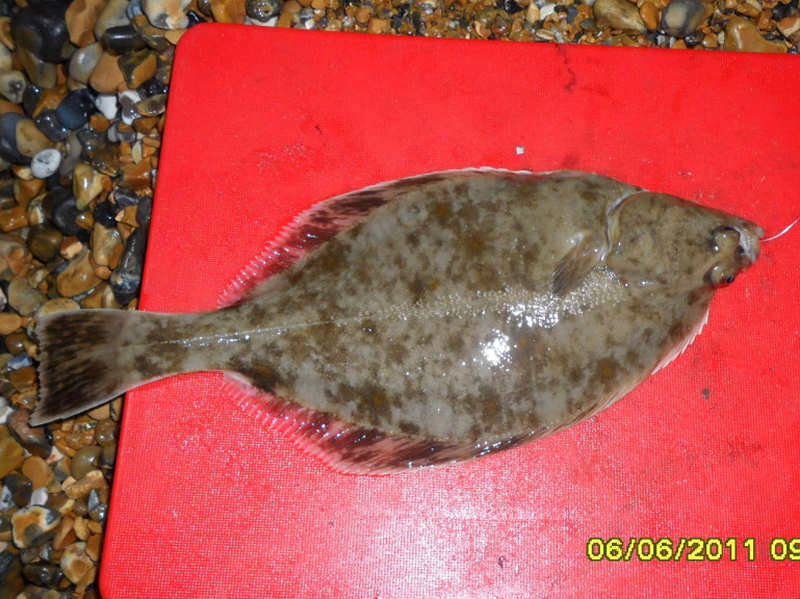 Once on the shingle, I could see a thumping sole flapping about and when I lifted it up, it felt like a nice weight. Had to cut the snood, as it had taken the size 2 deeply and once despatched it weighed in at 2lbs 4oz – woohoo a new personal best which beat my previous best by 12oz. The photo really doesn’t do it justice, it was a well conditioned firm thick fish of 40cm on the nose. 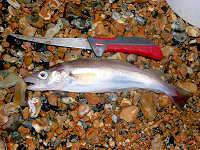 That was it as far as the worm rod went, with no other bites at all and still no whiting. It wasn’t until just before the 11pm high water that I had the next fish – an LSD (lesser spotted dogfish) that took the whole squid bait reasonably close in. 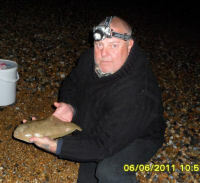 Once released, I re-baited with another squid and chucked it back out. It wasn’t long before another ‘doggy’ was on the beach and then that was it for the rest of the night. I stuck it out until about 1am before jacking it in. It was perhaps one of the quietest nights I’ve spent on the beach there but it was a most memorable one. It’s always great walking away with a new personal best. 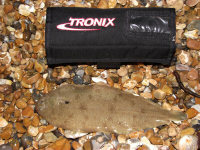 The sole rig is essentially a flapper but with an additional weight above the main rig body. 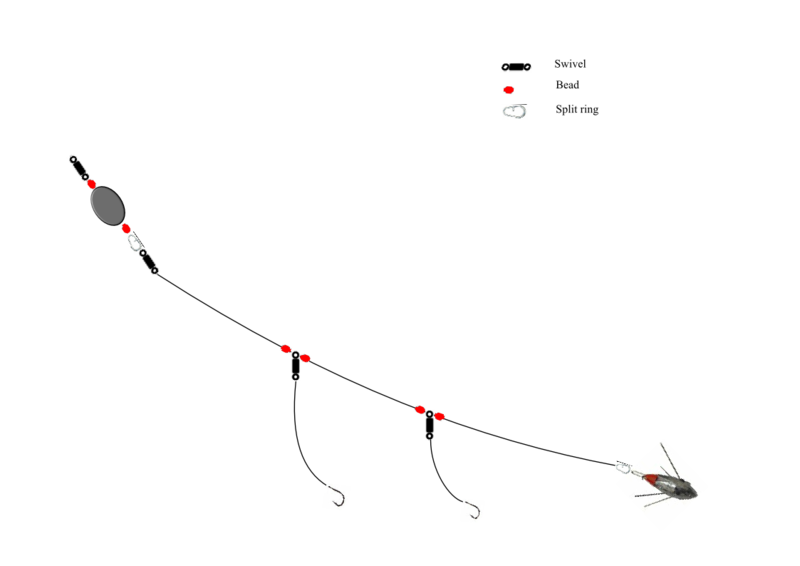 This means that when the rig hits the sea bed, it’s pinned down at both ends, ensuring that the baits are where the sole want them – on the deck and not waving around in the current above their heads. For these secondary weights, it’s best to use a lead that won’t roll around, so use something flat, like a coffin lead or as I do, get some of the ‘egg’ weights or balls. I insert heavy gauge wire through the hole and then bash the hell out of it with a hammer until it is flattened sufficiently, then remove the wire. This ensures that the hole isn’t squashed and preventing you putting your line through it. Depending on the conditions, I use anything from ½oz to 1½oz. Some rigs , have the secondary smaller weight permanently fixed to the rig body, held in place with crimps or similar. I prefer to have mine fixed on a short length of line (same poundage as the rig body) with a swivel at the top end and a split ring at the lower end. I can then quickly change between rigs – clip the secondary weight to the end of the main line and attach the lower end to the top end of a flapper and I have this rig. If I want to change to a flapper, I simply unclip the weighted segment and clip the flapper back to the end of the main line. I keep a selection of the secondary weight attachments, with varying weights to suit the conditions – another advantage over fixed weights. The only drawback to this rig is that it’s no good for long distance or power casting, the added secondary weight makes the whole rig ‘helicopter’ when in flight. My version also has more links, which means more knots and can seem too over-complicated but I find the versatility out-weighs the complication. Hook lengths are short, no more than six to eight inches – again, this makes sure the bait is on the deck. Hook size is also small; I use size 4 fine wire. If I need anything bigger, I just use another another flapper with a larger hook. This rig will in fact take any bottom feeding species, not just sole. 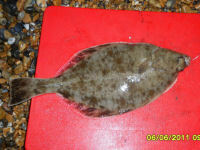 I have had success using it to take flounder, bass, eels, bream, gurnard, whiting, Pout as well as sole.